Assailed by scolding reviews of Michael Bay’s longest, most incoherent playground tantrum yet, audiences gave Transformers: Age Of Extinction the biggest opening of the year so far—taking a populist stand, like the heroes of the movie, for the rights of giant robots, against authoritarians who would seek to banish them just because they’re loud and exhausting. In this call for the people’s freedom to be crushed, physically and spiritually, by enormous machines, America was joined by China: Transformers may have taken in $100 million here, but the real news was its $90 million draw in Chinese theaters, which makes it the biggest ever for a foreign movie—and only days away from matching the all-time record-setting, $106 million first week of Stephen Chow’s Journey To The West: Conquering The Demons. The production made many overtures to China—shooting locally, casting Chinese actors through a reality show, inviting residents to come swing appliances at Michael Bay—and it obviously paid off. All told, Transformers’ success in China and other foreign nations, where the language barrier allows for Mark Wahlberg to put on glasses and be a scientist, led to a global box office total of more than $300 million. 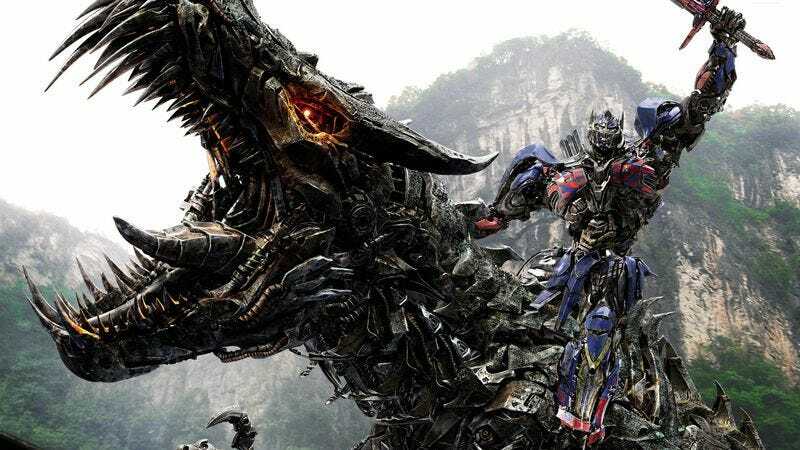 Box Office Mojo speculates that Age Of Extinction is now well on its way to a final worldwide haul of $1 billion—even if its U.S. opening is about $8 million down from Revenge Of The Fallen. On the back of a green light for Pacific Rim 2, some are now calling Age Of Extinction a turning point for Hollywood making movies with China in mind, a trend toward globalization that promises plenty of blockbusters to come where important plot points just happen to be found in lucrative Asian markets. Among the weekend’s other repetitions on a formula, Think Like A Man Too plummeted to fourth place from last week’s first-place perch, putting it in a position to finish well under its predecessor. (Think Like A Man As Well, This Time In China seems unlikely.) 22 Jump Street, on the other hand, held steady in second place and has already overtaken the first one, meaning talks are surely in progress for 23 Jump Street, Chaoyang District, Beijing 100027. In limited, non-giant-robot release, Chinese romantic comedy The Break-Up Guru was dwarfed both here and there, with the film taking in $67,000 in 12 theaters full of Americans who were relieved/disappointed to discover it was not a movie about Mike Myers and Vince Vaughn teaming up to dispense terrible romantic advice. But the big winners were Begin Again, with the promise of seeing Keira Knightley sing and Adam Levine be a self-aware douchebag earning it the highest per-screen average of the weekend, at $29,600 per five theaters; and Bong Joon-ho’s Snowpiercer, which took in the biggest total at $162,100. Also making a decent showing was Dinesh D’Souza’s America, with the right-wing provocateur earning $39,000 in three theaters for his screed about how the nation shouldn’t feel bad about Native Americans or slavery, from summertime moviegoers longing for escapism. Perhaps D’Souza’s next film can take a cue from Transformers and explore how Tianenman Square never actually happened.